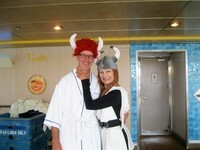 Voyage of the Vikings was a dream cruise for us. 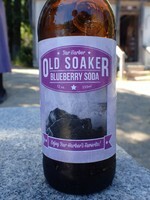 After reading reviews and following prior Viking voyages on line, we decided it was time for us to take the plunge. We are so happy we did it! Not everything was perfect but we didn’t let the small issues dampen our trip or the overall experience. MS Rotterdam is an older ship and despite reading complaints from other reviews, we felt the ship had character. There were a few water leaks on rainy days. The voice mail system was hard to figure out. Automated wake-up calls seldom rang at the requested time – either because the time change was not programmed in (one hour off) or it was programmed late (wake-up calls were 20 minutes late). One day, we had no cold water in our bathroom. A spa charge on our account on the first day was not ours and it took 3 weeks for them to remove it. 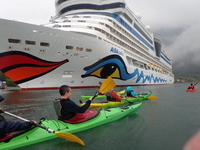 I mention these only to show that problems did arise but I believe it is mostly how you handle the problems that makes for a good or bad cruise. We had a good cruise! Embarkation in Boston was organized and did not take long. Although we were waiting at the terminal for 90 minutes, it was only because we arrived before the scheduled boarding time. Our plan was to drop our carry-on bags in the cabin, get lunch and then go sightseeing. We checked in at 1 pm and were off the ship at 1:30. We used local bus transportation to get into town. There is a bus stop near the terminal. Our ports are listed below. We missed 2 ports due to weather and missed one HAL excursion due to late arrival. There was a lot of fog encountered on this trip and a couple of days when it didn’t let up. Only one day was high seas with gale force winds. We had no problems with motion sickness. There was an outbreak of Norovirus during the cruise. The first announcement from the captain requested that everyone be diligent in washing their hands and using sanitizer stations. The captain made various announcements over the next wekk. The Lido staff began dishing out food and handling drinks for everyone, no more self-serve. Sick passengers were confined to their cabins by order of the Captain. This went on for over a week before the outbreak began to diminish. Food in the Lido was tasty. Made to order stations (Breakfast, Asian, Salads) were available and had new menus each day. We prefer to eat breakfast and lunch in the Lido. 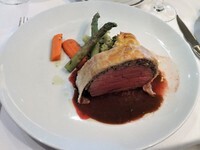 One day, we opted for lunch in the MDR and I was disappointed at the service and the food, which was not what I ordered. I know, easily corrected with only a word to the waiter but I chose not to make it an issue. We just never went back. Dinner in the MDR each day was a delight! Our waiters were always happy and the service was excellent! They knew our names from day one. Our table for 8 had only 5 show up. After the third day, the table service was set up for only 5. In Rotterdam, the big table was changed to a smaller size and set up for 6 people and we had someone new join us. Each evening was filled with good discussions and talk of the days activities, family and previous cruises. We all became friends and have since emailed each other. The menu items were seldom repeated. We had lobster 4 times. I like variety and trying new tastes, so it was funny when we all ordered the exact same entree at one meal! The Cruise Director was Linda Minikin. She was everywhere! IMO, she was the perfect CD. Intelligent, humorous, sincere and always had time for the passengers. Half the passengers on board were 4 or 5 star Mariners. Priority tendering was suspended for the entire cruise. Everyone required a tender ticket first come, first served. We had no problems getting off the ship and meeting with our prearranged tour groups. Activities on board included guest speakers. Their presentations were delivered to a full house and sometime even a standing room only crowd! This was an educational voyage after all. The Polar Plunge was a great event if you want to become a "true Viking". We crossed the Arctic Circle twice and everyone received a certificate for it. We used a free calling phone app while traveling and it worked fine above deck in port. No free internet in Greenland and very expensive phone service so we turned ours off. HAL Navigator app was very useful. Disembarkation was a breeze! US Customs was on board the day of debarkation. Passengers were called to the King’s Lounge in order of debarkation time. Early walk-off was called at 7:15 am. No bags, only passport and ship card. We stood in line about 7 minutes for a 10 second inspection. Returned to our cabin to collect our bags and wait for 8 am exit. We were off the ship by 8:20. It was great! Boston Check-in began at 1pm except 5 stars, who had special area and were brought on early. After check-in, we ate in lido then exited and took a bus into Boston. Bus stop is an easy walk from Terminal 1 and 2. We were back on board at 5 pm, went to dinner in MDR and then the 8 pm safety drill for those who did not attend the 4 pm safety drill. Our departure was at 10 pm. Bar Harbor – tender No priority tendering for 4 and 5 star during the entire cruise! Half the passengers (700) were in this group. There is a free bus service within Acadia NP but you must pay to enter the park. If you have an Annual Pass, be sure to bring it with you to avoid paying the entrance fee. There are different bus routes within the park. Buses run often although you may have to wait 30 minutes for some routes. Basically, they operate as HOHO. Be sure of your timing so you get back to the ship! 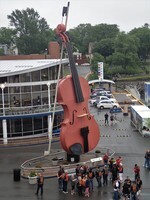 Sydney The big fiddle can’t be missed! You can get into town via the road or a boardwalk. There are a few places of interest near the port (house, church and Highlander museums, Tim Hortons) plus some interesting shops in town (craft & design centre). The port has some shops and free WiFi. There was a large craft show when we were there. Corner Brook Free local shuttle to and from town. You can also walk but it’s a busy road. Get directions. Go to Tom’s Port Guide for information on the local walking trails. We spent the day on the 8 km Gorge Trail and saw Lady Slipper flowers but not much else beyond the Margaret Bowater Park (you can swim in the river here). The modern City Hall has a museum and a grass roof. Bootleg Brew Co had a choice of 8 brews. Drunken Muppet and Just The Tip were good. Red Bay – tender We arrived but did not stay due to rough water determined to be unsafe for tendering. This became a sea day. Paamiut – tender We arrived and circled but did not stay due to increasing fog. Another sea day. Qaqortoq – tender Bug repellent and/or screen hoods are advised! Visitors center is across from the port. You can book excursions here. Very colorful town. Be sure to check out the stone art. The museum is worth $5. Old church with stream and flowers. Oldest water fountain in Greenland. We hiked all around the lake – beautiful. Suggest starting on the west side for a gradual incline then flat walking at the end. (3.5 hrs.) The Visitors Center was out of maps but I was able to get one at the museum. Reykjavik The port tourist information center is where you pick up tours and taxis. There is a free port shuttle to take you from the ship, but it’s not far to walk. City center is 3 km from the port. Taxi into town was 3400 ISK. There is a sidewalk all the way. The Sun Voyager sculpture is only accessible along the sidewalk. It is between the port and Harpa Concert Hall. You can see it from a vehicle. Harpa is free to enter. Walk up to level 5 for nice views. Walk up hill to the big church. Public swimming pool in town. Check the old harbor area for boat tours (puffins and whales) and seafood. We did the Golden Circle Tour on day one (awesome!) and Free City Walk on day 2. Need groceries? “Bonus” is a good stop. Credit cards accepted everywhere. 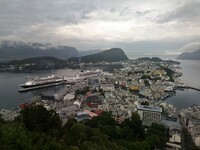 Alesund Beautiful town for walking around. A few museums are worthy of a look. If you are able, climb the 408 steps to the Fjellstua viewing point – stunning views of the city and the pier. An alternate walking trail takes you back down and passed some interesting spots including the only house that did not burn in the 1904 fire that destroyed the city. Rotterdam Bus and subway transportation is very near the port. There is also a public water bus pier on the other side of the river (walkable) which can take you to Kinderdijk to see working windmills. Some people took trains to Amsterdam or Belgium for the day or even overnight. Lots of walkable options nearby: Hotel New York, SS Rotterdam (free admission to public areas, charge for tours, food and drink), Food Factory, shops, cinemas and theater. Modern downtown area. Dublin Alexander Quay is very industrial. We were not allowed to walk beyond the ship although we did walk back to port when our taxi driver made a wrong turn and we opted to get out. At the terminal gate, we had to wait for a shuttle bus to arrive and take us the last 300 yards to the ship. HAL provided a shuttle into town for $8 OW or $16 RT per person. A taxi for 3 people was 15-18 GBP depending on traffic. Dublin central is very walkable but get a map because it’s easy to get confused on where you are in relation to where you are going. The streets are not perpendicular. Buy tickets in advance when possible. Lines can be very long. Book of Kells was interesting. Greenock I thought this would be a nothing stop but it turned out to be historically interesting. Be sure to pick up the free tour books – Town Trail and Historic Quarter – at the information booth. These will guide you through the town and its history. There is a lot here! Industry, religion, revolutions and sugar. 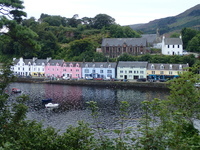 Portree – tender A sleepy little town with interesting shops and food. “The Chippy” was a good stop for fish and chips. 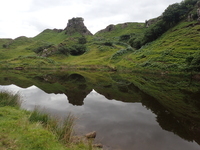 We took a tour to Fairy Glen, Uig, Duntulm, etc for 28 GBP for 4 hours. Excellent! Some great photos. Djupivogur - tender Boat trips to Papey Island were discontinued when we were there. There are a few art galleries that are free and filled with weird things. Be sure to check out the Gleoivik Eggs. Just past the eggs, you can access a path to the Aeoarsteinsviti lighthouse. You can take a trail to black sand beach and birdwatching but get a map first! There is an information booth at the campground. Akureyri Botanical garden, large church. Not sure what else since we took a full day tour to Godafoss and Lake Myvatn using Taxi No 17. Great tour. Scenic cruising after leaving port was awesome too. Isafjordur Small information booth at pier with free WiFi. Get directions to bigger info center. There is a map with 3 walking trails outlined. We did all of them during our walk around town. Be sure to check out the church with the clay birds behind the altar. Nanortalik - tender A large information building with souvenirs. The church choir performs a concert when ships come to port. $10 donation. Outdoor museum is $5. As you walk from the church to the outdoor museum, notice the large rock on your right with the profile of a man’s face. A few shops and two grocery stores, some craft tables. A walk thru the residential area has some colorful homes. A cemetery faces the bay. St Anthony – tender Nice gift shop at tender port. Small stores nearby. Hospital across the street has an ATM upstairs. Shopping area is a mile from the port. We booked a private tour to L’anse Aux Meadows. This is were Vikings arrived in North America. Excellent tour. Very nice people everywhere. Try the Bakeapple jam made from local berries. St John’s Port is right in town. One block to major street. City has a lot to see and do. We booked Legend Tour and saw all the highlights around the town then went into town for sightseeing and a beer. We went to the “Rooms” museum and arrived 30 minutes before closing. They let us in for free and suggested we stop on each floor and view the exhibits at the entrance in each section to get a flavor of what is offered. We had just enough time to finish. Lots of colorful houses. Halifax Port was next to famous Pier 21 where all the immigrants arrived. It is now a museum and worthy of a look. I found my mom’s passenger records and ship registry here. There is a new boardwalk with many shops and restaurants. A huge Farmer’s Market is on the way. We did a tour to Peggy’s Cove and other sites that was fantastic. The cemetery with Titanic graves was interesting. Harpa in Reykjavik. Free to enter and walk up to level 5. Preparing for the Polar Plunge with encouragement of Cruise Director Linda. HAL kayak excursion was better than expected. Voyage of the Vikings was a dream cruise for us. After reading reviews and following prior Viking voyages on line, we decided it was time for us to take the plunge. We are so happy we did it! Not everything was perfect but we didn’t let the small issues dampen our trip or the overall experience. MS Rotterdam is an older ship and despite reading complaints from other reviews, we felt the ship had character. There were a few water leaks on rainy days. The voice mail system was hard to figure out. Automated wake-up calls seldom rang at the requested time – either because the time change was not programmed in (one hour off) or it was programmed late (wake-up calls were 20 minutes late). One day, we had no cold water in our bathroom. A spa charge on our account on the first day was not ours and it took 3 weeks for them to remove it. I mention these only to show that problems did arise but I believe it is mostly how you handle the problems that makes for a good or bad cruise. We had a good cruise! Embarkation in Boston was organized and did not take long. Although we were waiting at the terminal for 90 minutes, it was only because we arrived before the scheduled boarding time. Our plan was to drop our carry-on bags in the cabin, get lunch and then go sightseeing. We checked in at 1 pm and were off the ship at 1:30. We used local bus transportation to get into town. There is a bus stop near the terminal. Our ports are listed below. We missed 2 ports due to weather and missed one HAL excursion due to late arrival. There was a lot of fog encountered on this trip and a couple of days when it didn’t let up. Only one day was high seas with gale force winds. We had no problems with motion sickness. There was an outbreak of Norovirus during the cruise. The first announcement from the captain requested that everyone be diligent in washing their hands and using sanitizer stations. The captain made various announcements over the next wekk. The Lido staff began dishing out food and handling drinks for everyone, no more self-serve. Sick passengers were confined to their cabins by order of the Captain. This went on for over a week before the outbreak began to diminish. Food in the Lido was tasty. Made to order stations (Breakfast, Asian, Salads) were available and had new menus each day. We prefer to eat breakfast and lunch in the Lido. One day, we opted for lunch in the MDR and I was disappointed at the service and the food, which was not what I ordered. I know, easily corrected with only a word to the waiter but I chose not to make it an issue. We just never went back. Dinner in the MDR each day was a delight! Our waiters were always happy and the service was excellent! They knew our names from day one. Our table for 8 had only 5 show up. After the third day, the table service was set up for only 5. In Rotterdam, the big table was changed to a smaller size and set up for 6 people and we had someone new join us. Each evening was filled with good discussions and talk of the days activities, family and previous cruises. We all became friends and have since emailed each other. The menu items were seldom repeated. We had lobster 4 times. I like variety and trying new tastes, so it was funny when we all ordered the exact same entree at one meal! The Cruise Director was Linda Minikin. She was everywhere! IMO, she was the perfect CD. Intelligent, humorous, sincere and always had time for the passengers. Half the passengers on board were 4 or 5 star Mariners. Priority tendering was suspended for the entire cruise. Everyone required a tender ticket first come, first served. We had no problems getting off the ship and meeting with our prearranged tour groups. Activities on board included guest speakers. Their presentations were delivered to a full house and sometime even a standing room only crowd! This was an educational voyage after all. The Polar Plunge was a great event if you want to become a "true Viking". We crossed the Arctic Circle twice and everyone received a certificate for it. We used a free calling phone app while traveling and it worked fine above deck in port. No free internet in Greenland and very expensive phone service so we turned ours off. HAL Navigator app was very useful. Disembarkation was a breeze! US Customs was on board the day of debarkation. Passengers were called to the King’s Lounge in order of debarkation time. Early walk-off was called at 7:15 am. No bags, only passport and ship card. We stood in line about 7 minutes for a 10 second inspection. Returned to our cabin to collect our bags and wait for 8 am exit. We were off the ship by 8:20. It was great! Check-in began at 1pm except 5 stars, who had special area and were brought on early. After check-in, we ate in lido then exited and took a bus into Boston. Bus stop is an easy walk from Terminal 1 and 2. We were back on board at 5 pm, went to dinner in MDR and then the 8 pm safety drill for those who did not attend the 4 pm safety drill. Our departure was at 10 pm. No priority tendering for 4 and 5 star during the entire cruise! Half the passengers (700) were in this group. There is a free bus service within Acadia NP but you must pay to enter the park. If you have an Annual Pass, be sure to bring it with you to avoid paying the entrance fee. There are different bus routes within the park. Buses run often although you may have to wait 30 minutes for some routes. Basically, they operate as HOHO. Be sure of your timing so you get back to the ship! The big fiddle can’t be missed! You can get into town via the road or a boardwalk. There are a few places of interest near the port (house, church and Highlander museums, Tim Hortons) plus some interesting shops in town (craft & design centre). The port has some shops and free WiFi. There was a large craft show when we were there. Free local shuttle to and from town. You can also walk but it’s a busy road. Get directions. Go to Tom’s Port Guide for information on the local walking trails. We spent the day on the 8 km Gorge Trail and saw Lady Slipper flowers but not much else beyond the Margaret Bowater Park (you can swim in the river here). The modern City Hall has a museum and a grass roof. Bootleg Brew Co had a choice of 8 brews. Drunken Muppet and Just The Tip were good. We arrived but did not stay due to rough water determined to be unsafe for tendering. This became a sea day. We arrived and circled but did not stay due to increasing fog. Another sea day. Bug repellent and/or screen hoods are advised! Visitors center is across from the port. You can book excursions here. Very colorful town. Be sure to check out the stone art. The museum is worth $5. Old church with stream and flowers. Oldest water fountain in Greenland. We hiked all around the lake – beautiful. Suggest starting on the west side for a gradual incline then flat walking at the end. (3.5 hrs.) The Visitors Center was out of maps but I was able to get one at the museum. The port tourist information center is where you pick up tours and taxis. There is a free port shuttle to take you from the ship, but it’s not far to walk. City center is 3 km from the port. Taxi into town was 3400 ISK. There is a sidewalk all the way. 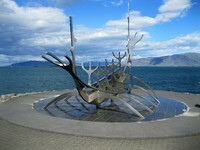 The Sun Voyager sculpture is only accessible along the sidewalk. 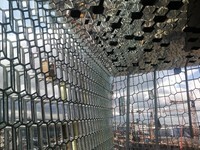 It is between the port and Harpa Concert Hall. You can see it from a vehicle. Harpa is free to enter. Walk up to level 5 for nice views. Walk up hill to the big church. Public swimming pool in town. Check the old harbor area for boat tours (puffins and whales) and seafood. 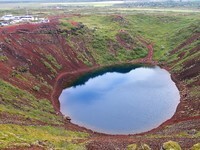 We did the Golden Circle Tour on day one (awesome!) and Free City Walk on day 2. Need groceries? “Bonus” is a good stop. Credit cards accepted everywhere. Beautiful town for walking around. A few museums are worthy of a look. If you are able, climb the 408 steps to the Fjellstua viewing point – stunning views of the city and the pier. An alternate walking trail takes you back down and passed some interesting spots including the only house that did not burn in the 1904 fire that destroyed the city. Bus and subway transportation is very near the port. There is also a public water bus pier on the other side of the river (walkable) which can take you to Kinderdijk to see working windmills. Some people took trains to Amsterdam or Belgium for the day or even overnight. Lots of walkable options nearby: Hotel New York, SS Rotterdam (free admission to public areas, charge for tours, food and drink), Food Factory, shops, cinemas and theater. Modern downtown area. Alexander Quay is very industrial. We were not allowed to walk beyond the ship although we did walk back to port when our taxi driver made a wrong turn and we opted to get out. At the terminal gate, we had to wait for a shuttle bus to arrive and take us the last 300 yards to the ship. HAL provided a shuttle into town for $8 OW or $16 RT per person. A taxi for 3 people was 15-18 GBP depending on traffic. Dublin central is very walkable but get a map because it’s easy to get confused on where you are in relation to where you are going. The streets are not perpendicular. Buy tickets in advance when possible. Lines can be very long. Book of Kells was interesting. I thought this would be a nothing stop but it turned out to be historically interesting. Be sure to pick up the free tour books – Town Trail and Historic Quarter – at the information booth. These will guide you through the town and its history. There is a lot here! Industry, religion, revolutions and sugar. A sleepy little town with interesting shops and food. “The Chippy” was a good stop for fish and chips. We took a tour to Fairy Glen, Uig, Duntulm, etc for 28 GBP for 4 hours. Excellent! Some great photos. Boat trips to Papey Island were discontinued when we were there. There are a few art galleries that are free and filled with weird things. Be sure to check out the Gleoivik Eggs. Just past the eggs, you can access a path to the Aeoarsteinsviti lighthouse. You can take a trail to black sand beach and birdwatching but get a map first! There is an information booth at the campground. Botanical garden, large church. Not sure what else since we took a full day tour to Godafoss and Lake Myvatn using Taxi No 17. Great tour. Scenic cruising after leaving port was awesome too. Small information booth at pier with free WiFi. Get directions to bigger info center. There is a map with 3 walking trails outlined. We did all of them during our walk around town. Be sure to check out the church with the clay birds behind the altar. A large information building with souvenirs. The church choir performs a concert when ships come to port. $10 donation. Outdoor museum is $5. As you walk from the church to the outdoor museum, notice the large rock on your right with the profile of a man’s face. A few shops and two grocery stores, some craft tables. A walk thru the residential area has some colorful homes. A cemetery faces the bay. Nice gift shop at tender port. Small stores nearby. Hospital across the street has an ATM upstairs. Shopping area is a mile from the port. We booked a private tour to L’anse Aux Meadows. This is were Vikings arrived in North America. Excellent tour. Very nice people everywhere. Try the Bakeapple jam made from local berries. Port is right in town. One block to major street. City has a lot to see and do. 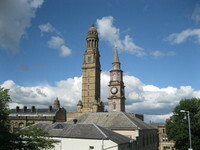 We booked Legend Tour and saw all the highlights around the town then went into town for sightseeing and a beer. We went to the “Rooms” museum and arrived 30 minutes before closing. They let us in for free and suggested we stop on each floor and view the exhibits at the entrance in each section to get a flavor of what is offered. We had just enough time to finish. Lots of colorful houses. Port was next to famous Pier 21 where all the immigrants arrived. It is now a museum and worthy of a look. I found my mom’s passenger records and ship registry here. There is a new boardwalk with many shops and restaurants. A huge Farmer’s Market is on the way. We did a tour to Peggy’s Cove and other sites that was fantastic. The cemetery with Titanic graves was interesting. 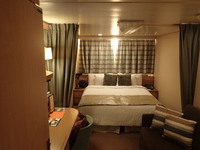 Cabin 2530 Large Inside Cat L for 3 people. King bed and a sofa bed. Both were very comfortable. Cabin stewards were very attentive and courteous. Cabin was well maintained twice daily. No issues. We brought along an extension cord and a multi plug outlet for additional connections. 2 USB ports available for charging phones and laptop. Tender - No priority tendering for 4 and 5 star during the entire cruise! Half the passengers (700) were in this group. There is a free bus service within Acadia NP but you must pay to enter the park. If you have an Annual Pass, be sure to bring it with you to avoid paying the entrance fee. There are different bus routes within the park. Buses run often although you may have to wait 30 minutes for some routes. Basically, they operate as HOHO. Be sure of your timing so you get back to the ship! Alexander Quay is very industrial. We were not allowed to walk beyond the ship although we did walk back to port when our taxi driver made a wrong turn and we opted to get out. At the terminal gate, we had to wait for a shuttle bus to arrive and take us the last 300 yards to the ship. HAL provided a shuttle into town for $8 OW or $16 RT per person. A taxi for 3 people was 15-18 GBP depending on traffic. Dublin central is very walkable but get a map because it’s easy to get confused on where you are in relation to where you are going. The streets are not perpendicular. Buy tickets in advance when possible. Lines can be very long. Book of Kells was interesting. 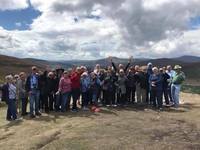 Wild Wicklow Tours was amazingly fun and interesting. 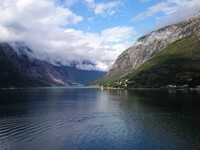 Took HAL excursion - Kayaking in the fjord. Look at the rock art and note the sculpture with the face carved inward. The face will follow you as you move from side to side! Spooky! Port is right in town. One block to major street. City has a lot to see and do. We booked Legend Tour and saw all the highlights around the town. After the tour, we went into town for sightseeing and a beer. We went to the “Rooms” museum and arrived 30 minutes before closing. They let us in for free and suggested we stop on each floor and view the exhibits at the entrance in each section to get a flavor of what is offered. We had just enough time to finish. Lots of colorful houses.